This gallery contains a single collection of Symbalas. I call this collection of 53 Symbalas the Life Path Collection. It is inspired by the writings and research of Robert Lee Camp, who calls them 'The Cards of Your Destiny' in his many books. There is more detailed information on his website, including free Destiny readings, books, classes, etc. The Destiny Cards, a very complex divination system, are disguised as our standard 52 playing cards (53, including the Joker) found everywhere. And like all truly important and magical things they are hiding in plain sight! They contain keys to unlock understanding of self and the planet. All major civilizations take credit for inventing them, so they probably came from Atlantis. The cards have many symbolic connections to the major systems of divination and are linked to our human journey along with the nature of our planet in time and space. Each person's BIRTHDAY is represented by one of the 53 cards/Life Path Symbalas. This allows a very fine focus for understanding yourself and your life path. Here is a chart allowing you to quickly find which card your birthday is linked to. I am very drawn to this system for many reasons. I've always loved to play cards, since I was a child. Numbers fascinate me, not their arithmetic value, but their vibratory and symbolic natures illuminating universal principles. The cards evoke these principles in a very revealing way. The number 52 begins it all. By reducing it: 5 + 2 = 7, we find the number of days in a week which leads to the 52 weeks in a year. There are 13 cards in each of 4 suits and 4 x 13 = 52 again. Seven is a very spiritual number, also related to the Chakras, and integral to the magic found in the cards. It also marks the exact midway point between the Ace and the King, a true pivotal point. 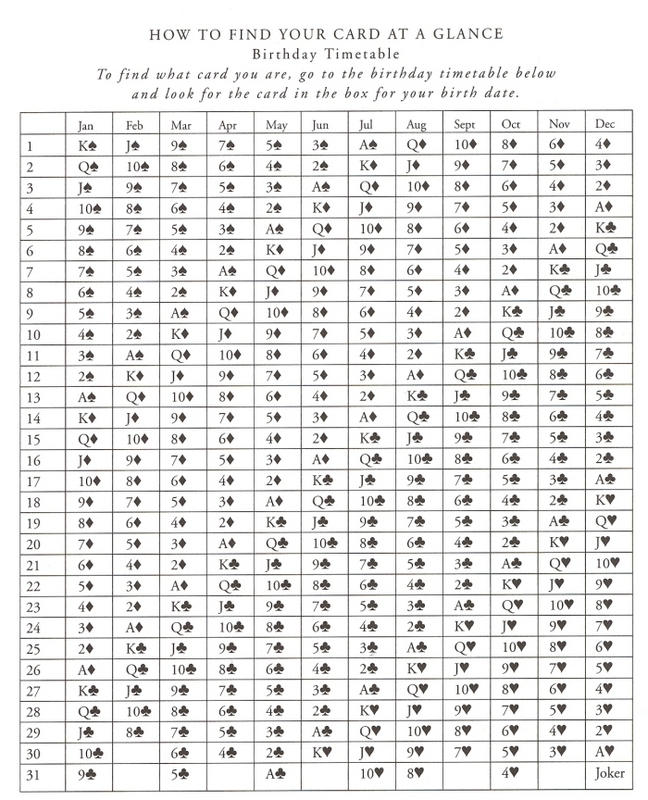 Each card has a numerical value beginning with the Ace as 1 through the King as 13. If you add the numerical values of all 52 cards, you get 364. The missing 1 1/4 to complete the year resides in the Joker. The Joker is represented by 5/4ths because it can be any of the 4 suits, plus itself! It also relates to the Fool in the Tarot. The 12 court cards (Jacks, Queeens and Kings) connect to the 12 months and the 12 signs of the Zodiac. The 4 is an important symbol, as well. The 4 card suits connect with the 4 seasons, the 4 directions and the 4 elements. I used some of these connections, including a complementary color/Chakra theme suggested by my friend and associate, Arlene Arnold (www.TransformationalTools.com), a color therapist. Each of the Symbalas in a suit contains its suit symbol, a color theme and a frequency reflection to its number. These are deeply symbolic tools. You will see that the Hearts are done with a Red/Green theme connecting them to the season of spring/youth and the 1st and 4th Chakras; Clubs are done with Orange/Blue connecting them to the season of summer/adolescence and the 2nd and 5th Chakras; Diamonds are done with Yellow/Purple connecting them to the season of autumn/maturity and the 3rd and 6th Chakras, and the Spades are done with a rainbow pallet connecting them to the season of winter/old age and the 7th Chakra. Remember, you Spade birthdays, these are symbolic connections only. More about the suits. I have been aware of the 'Cards of Destiny' and their accuracy for years. Wanting to express their energies using the Symbala form had been floating around in my imagination for a long time, but I have learned to trust the knowing that comes with personal right timing. I had done background work and discussed it with friends and I had INTENTION, but one morning I awakened just knowing where I needed to begin, which happened to be the 4 of Hearts. This gave me a focus in the now and not on the daunting scope of this very large project. The Gallery is organized by the 13 numbers in each suit, Ace through King, plus the Joker. Each group expresses through the four suits, Hearts, Clubs, Diamonds and Spades, with a brief explanation introducing their qualities. Each of the cards/Symbalas has a title, bestowed by Robert Lee Camp, the birthdays linked to it and a few famous people sharing that card. At present the Life Path Symbalas are available as 8 1/2 x 11 inch prints in the Symbala Store. They are also available as 5 x 7 inch greeting cards in my Zazzle Store (see flash panels on the 'Suits' page). These are great birthday cards, so unique and resonant to the individual! Begin your journey through the Life Path Symbalas Gallery by clicking on any of the 14 navigational buttons below and enjoy!